Summary: From director J.J. Abrams (“Mission: Impossible III,” “Lost” and “Alias“), producers Damon Lindelof and Bryan Burk and screenwriters Roberto Orci & Alex Kurtzman (“TRANSFORMERS,” “MI: III”) comes a new vision of the greatest space adventure of all time, “Star Trek,” featuring a young, new crew venturing boldly where no one has gone before. The greatest adventure of all time begins with Star Trek, the incredible story of a young crew’s maiden voyage onboard the most advanced starship ever created: the U.S.S. Enterprise. In the midst of an incredible journey full of optimism, intrigue, comedy and cosmic peril, the new recruits must find a way to stop an evil being whose mission of vengeance threatens all of mankind. he fate of the galaxy rests in the hands of bitter rivals born worlds apart. One, James Tiberius Kirk (Chris Pine), a delinquent, thrill-seeking Iowa farm boy, a natural-born leader in search of a cause. 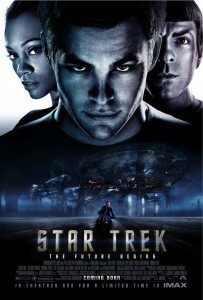 The other, Spock (Zachary Quinto), grows up on the planet Vulcan, an outcast due to his half-human background, which makes him susceptible to the volatile emotions that Vulcans have long lived without, and yet an ingenious, determined student, who will become the first of his kind accepted into the Starfleet Academy.